I was educated at Downside and then served in the Royal Navy. I resigned my commission as a Lieutenant and subsequently spent fifteen years as an executive of De Beers Consolidated Mines Ltd leaving to set up my own retail jewellery business in 1977. During my time with De Beers I acquired extensive knowledge of diamonds and the diamond industry which included a period of working in an Antwerp diamond cutting factory. I became a Freeman of the prestigious Worshipful Company of Goldsmiths' and also a Freeman of the City of London in 1981. I was clothed with the Livery of the Company in 1984. The Worshipful Company of Goldsmiths' is one of the Great Twelve Livery Companies of the City of London. It received it Royal Charter from King Edward the Third in 1327. 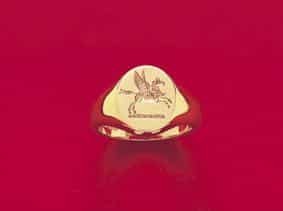 I specialise in seal engraved signet rings and engraved cufflinks which are all hand engraved not machine engraved.